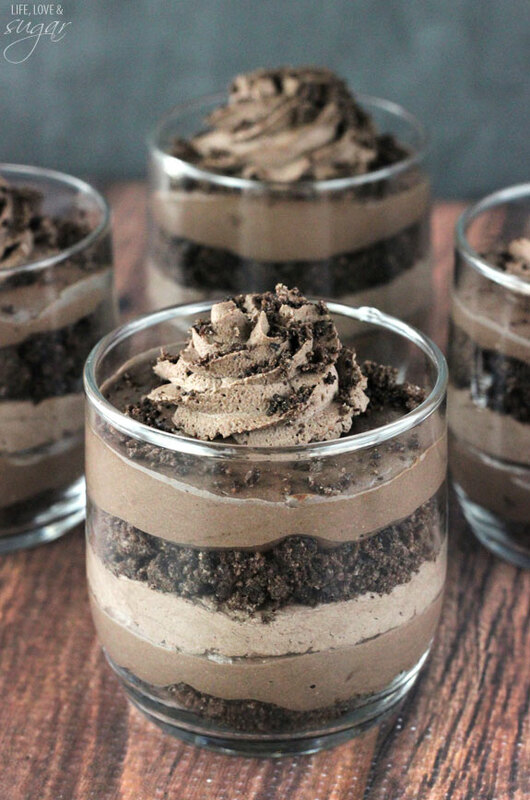 These Mini Baileys Chocolate Cheesecake Trifles are full of chocolate and Baileys flavor! I am totally in love with the fun mix in textures. Between no bake cheesecake, cookie crumbles and whipped cream – these trifles have it all! Well, that happened to me the other day. I bought all the stuff to make dinner in the slow cooker for a night the latter part of last week. I try to have a slow cooker meal at least one night a week – usually Wednesday, since that’s the night we go to small group. Well for some reason I just could not remember to put everything into the slow cooker in the morning. Twice I forgot to do it. Twice. So finally Monday morning, I was all ready to go. The meat needed to be used since we’d been out of town for the weekend and I couldn’t use it. So I put the stuff I needed right in the middle of the counter Sunday night so that there was no way I’d forget the next day. And I didn’t! I put everything into the pot and felt awesome about it. I couldn’t wait to get home to dinner already made, leaving me more time to bake. Then I walked in the door after work and realized that while I had put everything into the slow cooker, I never turned the thing on. FAIL! For the third time. It’s the story of my life lately. Too many things swirling around in my head at one time. Too many fails. Fortunately it was something I could throw on the stove and cook and it turned out fine. The hubs was happy with it, so that was what mattered. I sure hope you love Baileys as much as I do. 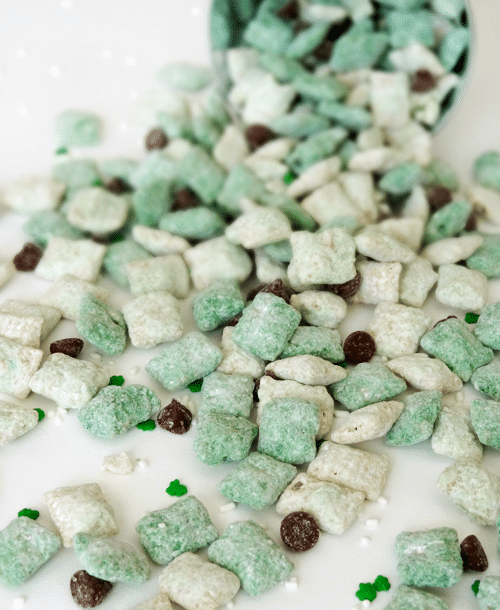 I have used it in so many recipes – Baileys Puppy Chow, Baileys Chocolate Pie, No Bake Baileys Cookie Balls, Baileys Chocolate Cookies dipped in white chocolate. So many things to love with two layers of each. 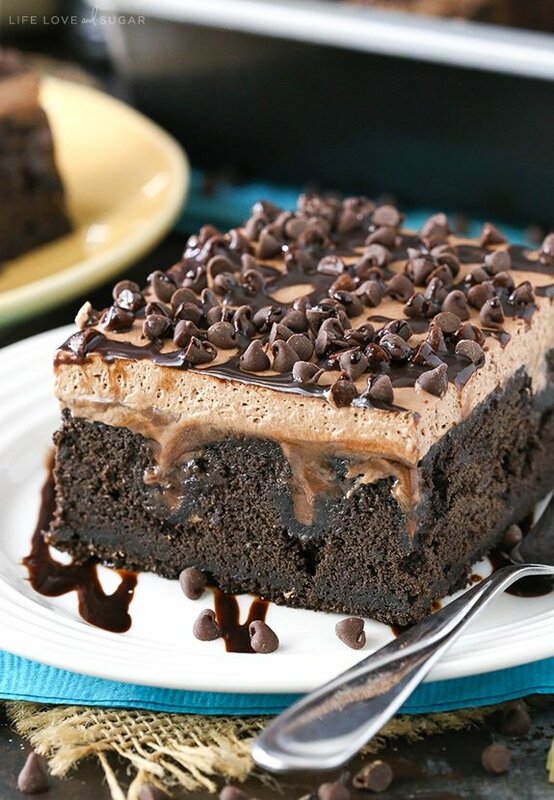 The Baileys, the chocolate – yum! I used dark cocoa, so these have a very deep chocolatey flavor. You could certainly use regular cocoa, if you prefer. 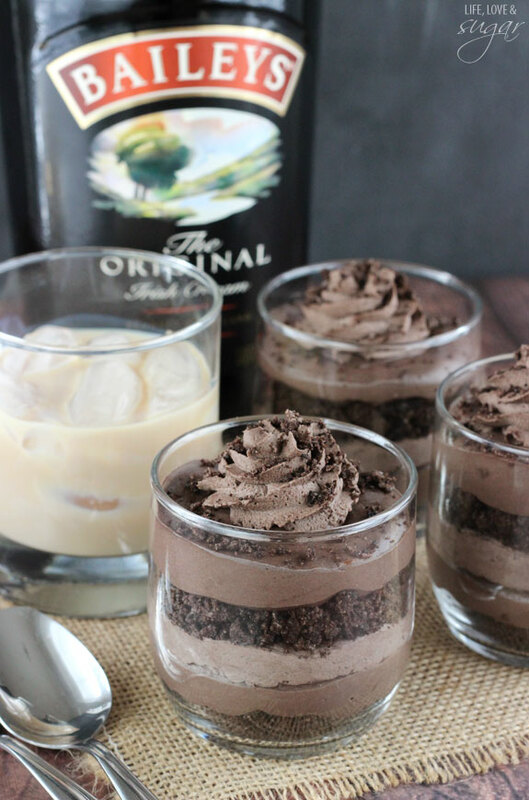 These cheesecake trifles would make an awesome treat for St. Patrick’s Day, or for any time you’re looking to spice things up with some Baileys action. I mean really, is there ever a bad time for Baileys? Not in my opinion! 1. Beat cream cheese, sugar and cocoa together in a bowl until smooth. 2. Add Baileys and mix until well incorporated. Set aside. 3. In another bowl, whip heavy whipping cream until it starts to thicken. 4. Add Baileys, cocoa and powdered sugar and continue to whip until stiff peaks form. 5. 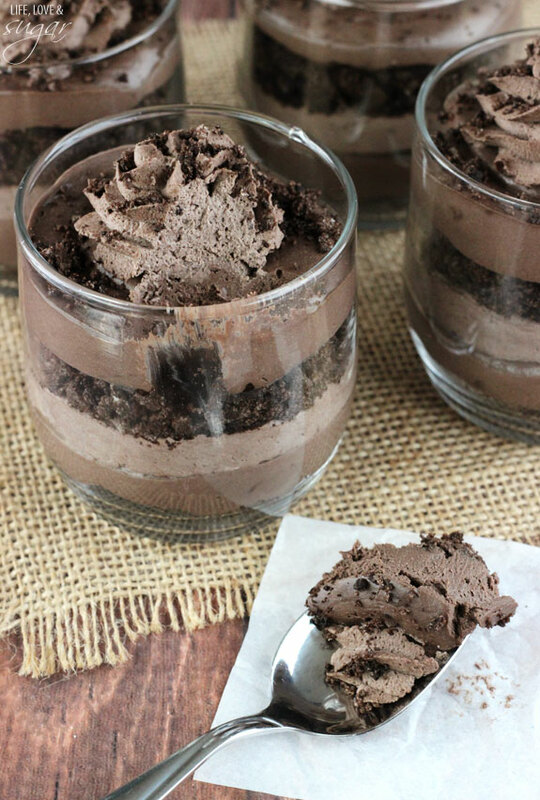 To make the trifles, divide half of the cookie crumbs evenly between the four cups (or jars) and spread into an even layer in the bottom of the cups. 6. 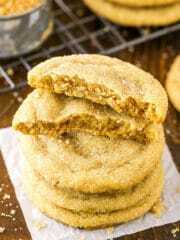 Pipe, or spoon, an even layer of cheesecake filling on top of the cookie crumbs in each of the four cups. You should only use about half of the filling. 7. 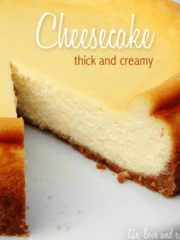 Pipe, or spoon, an even layer of whipped cream on top of the cheesecake filling in each of the four cups. 8. Divide remaining cookie crumbs between the four cups and evenly distribute the second layer of crumbs on top of the whipped cream. You can keep a little bit of crumbs aside, if you want to use them to sprinkle on top of the finished trifles. 9. Pipe, or spoon, remaining cheesecake filling on top of cookie crumbs, distributing evenly between the four cups. 10. Top each trifle with a swirl of whipped cream and a few more cookie crumbs, if you kept some aside in step 8. 11. Refrigerate until ready to serve. I recommend setting them out for about 15 minutes prior to eating, so that they aren’t too firm. That head-smack moment when you realize you forgot to turn the slow cooker on…the opposite of priceless. I love these! Any excuse to use Bailey’s, really. But in little adorable trifles, even better! 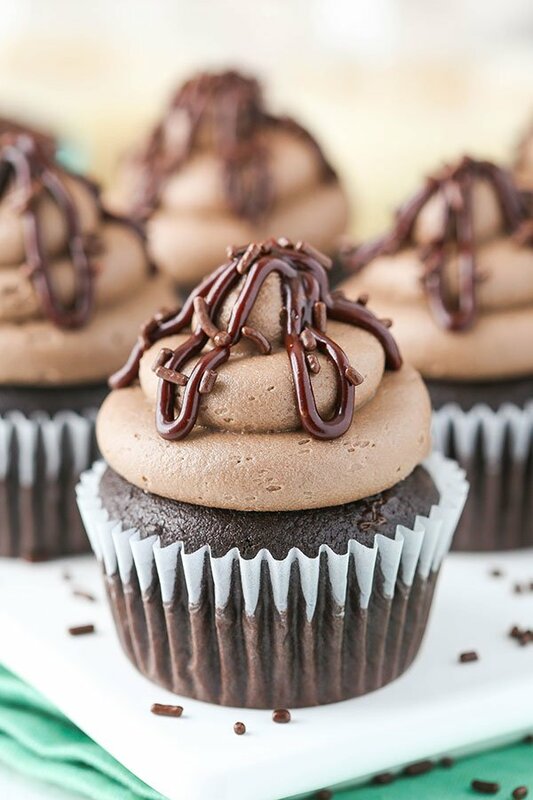 I can imagine these to be really delicious as I am a huge fan of Bailey´s, especially in baking! 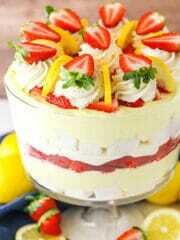 I’m loving these trifles! They are gorgeous and I bet they taste amazing with the addition of the Bailey’s. ugh, forgetting to turn the slow cooker on is the worst!! 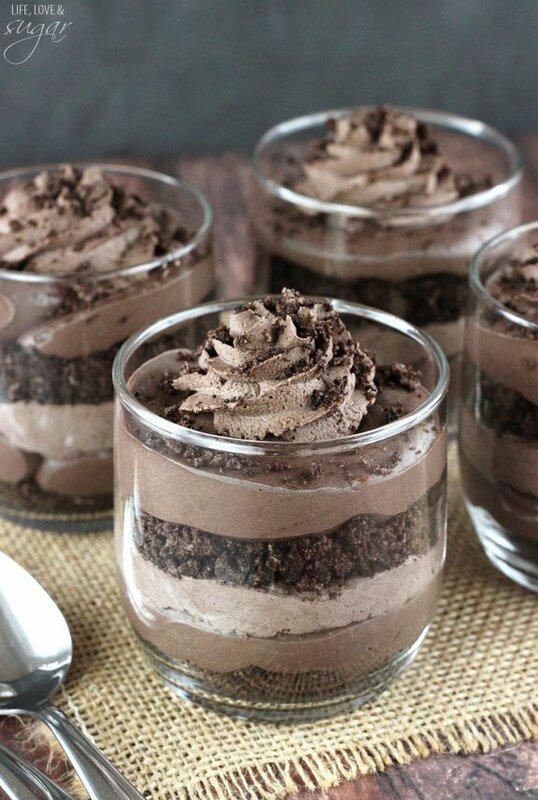 but these trifles would definitely fix any bad day! yum!! 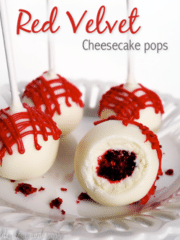 These look FABULOUS (high pitched voice). I can’t even deal with how badly I am craving two of these right now. Not one, but at least two (at the bare minimum). Wow wow and WOW! These parfaits are just gorgeous! 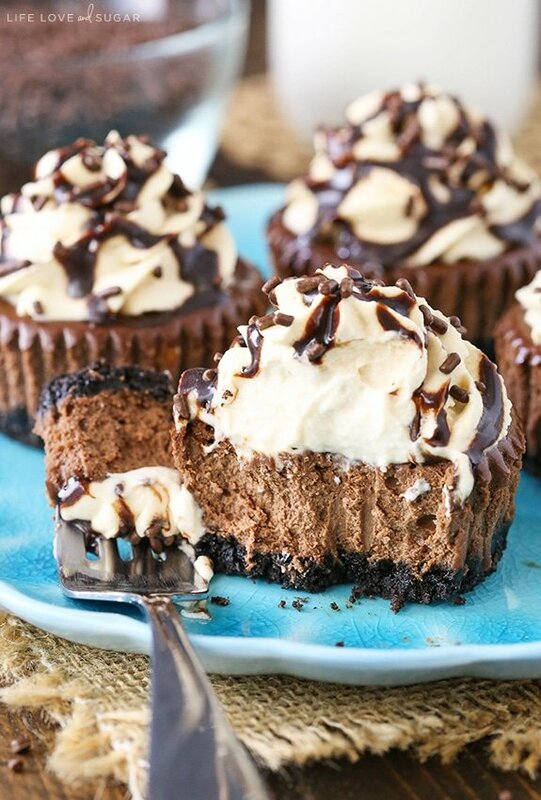 Chocolate, cheesecake, Oreos – what’s not to love?! I haven’t done that, so it’s hard for me to say how much the ingredients would change. You’d need to at least triple it, probably more. 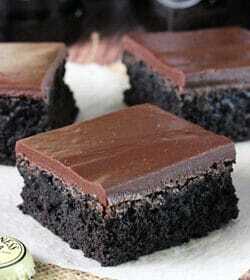 I might recommend using some cut up brownies as layers so that you aren’t having to crush a ton of cookies. 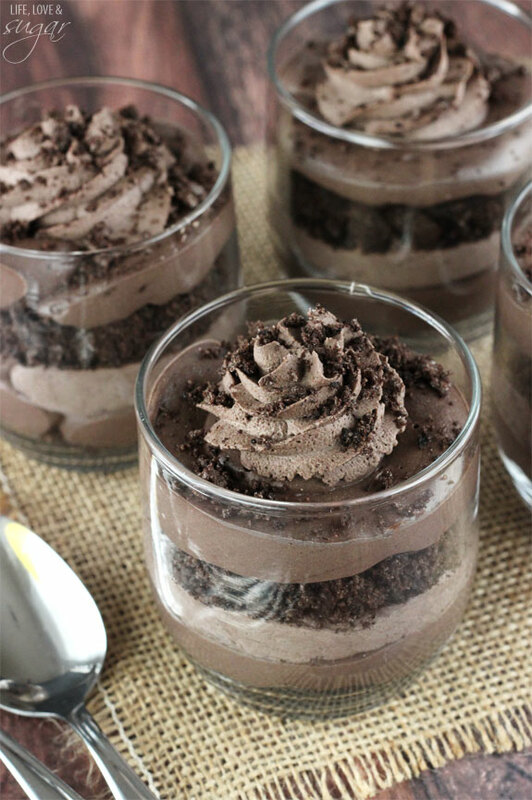 Can you make this as a trifle in a large bowl for a group? I would think so, but I haven’t done it, so it’s hard for me to say how to adjust. I’d consider using some brownies though instead of crushing up that many cookies. You’d probably need to at least triple the recipe. These look fabulous! What size glasses did you use? They are 8 oz glasses. Do you use the whole Oreo or do you take the filling out? I used granulated sugar. I’ve use it many times and never noticed it being granular in the cheesecake. It should be fine. Cream cheese layer and cream layer seemed to turn out the same colour. Couldn’t see the difference when placed in the glass. Any ideas??? That’s hard to say but I find that the colors darken as they sit. 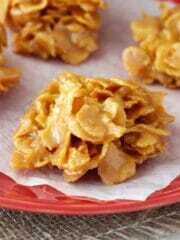 These are easy and come out very pretty, but I didn’t care for the cream cheese layor. It had an odd taste. I’m glad I tried them before I made them for company. The cookie and whipped cream were the only parts that were compelling to eat. I agree the cream cheese layer was ‘odd’ and mostly uneaten. I just remade the cream cheese layer to see if I could get that “odd” taste and it seems fine to me. I can’t figure out what that would be. The only thing I can think is that cream cheese can have a bit of tang to it and maybe that’s what you’re tasting? I would think that 1/2 cup of sugar would cut that down and be fine, but if not you could try adding a bit more sugar or even more cocoa? 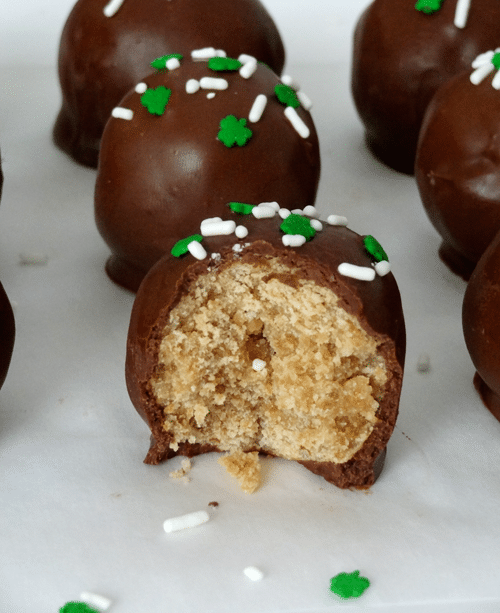 Even a bit of vanilla extract could help balance it out a bit – I just didn’t want to take away from the Baileys flavor. It should be easy to taste it while making it so that you are happy with the flavor before layering it into the cups. 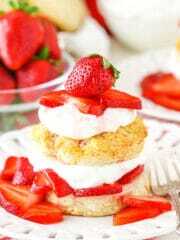 Oh I wish I knew the uk recipe measurements this looks gorgeous !! Cheesecake , baileys ans Oreos what’s not to like! How many glasses did this make? How far in advance can you make the trifles? The day before or will the whipped cream mixture seperate? The whipped cream mixture shouldn’t separate. The powdered sugar gives it stability. You should be able to make them a day or two in advance. 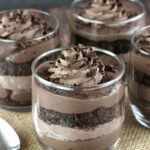 Chocolate cheesecake trifles does sound really good. 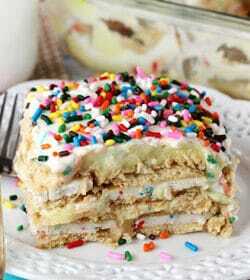 Oh, my wife and kids would go crazy if I made them this type of tasty treat. 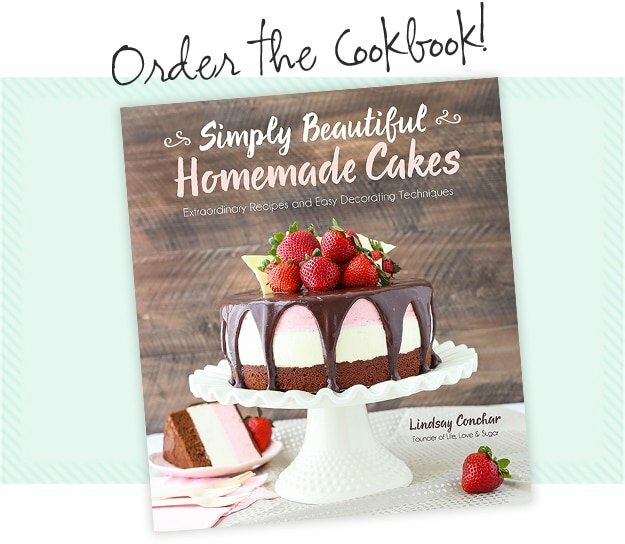 They each have a passion for chocolate and even enjoy making chocolaty desserts. Do you use Baileys the liquor or Baileys the coffee creamer? I use the liqueur, but the creamer would be fine too. If I make these on a sunday, do you think they’ll still be alright to serve on the tuesday? Sorry that I’m getting to your question late. These would last for 2-3 days though and be fine. These look delicious!! I can’t wait to make them, along with everything else you post!! Could I just omit the Baileys in both the cheesecake and the whipped cream or would it need to be replaced with something else? You can just leave the Baileys out of the whipped cream, but in the cheesecake layers I’d replace it with either milk or sour cream. Enjoy! 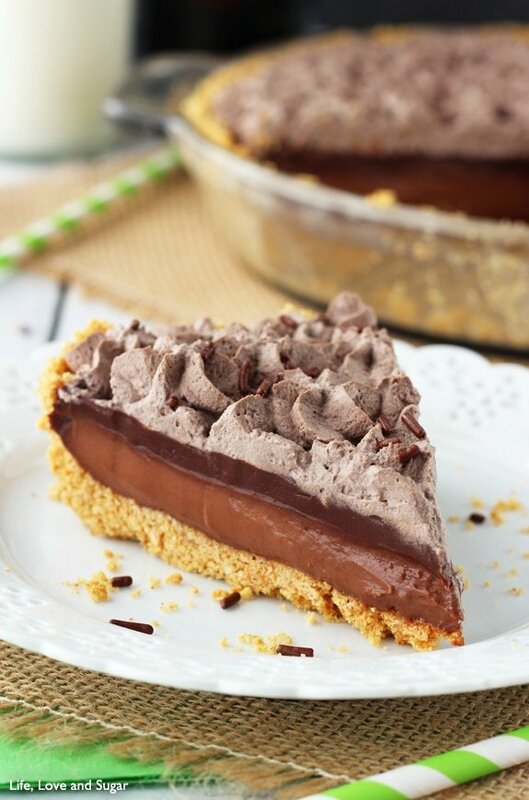 I’m making this for Father’s Day (my dad is a real nut for anything chocolate). I’m pretty excited about it and can’t wait to assemble them (the glasses I bought are being washed right now while the layers chill in the fridge) and have my dad taste it 🙂 I did make a few small changes; I added an extra teaspoon of Baileys and a pinch more sugar to the whipped cream just to give it an extra kick. 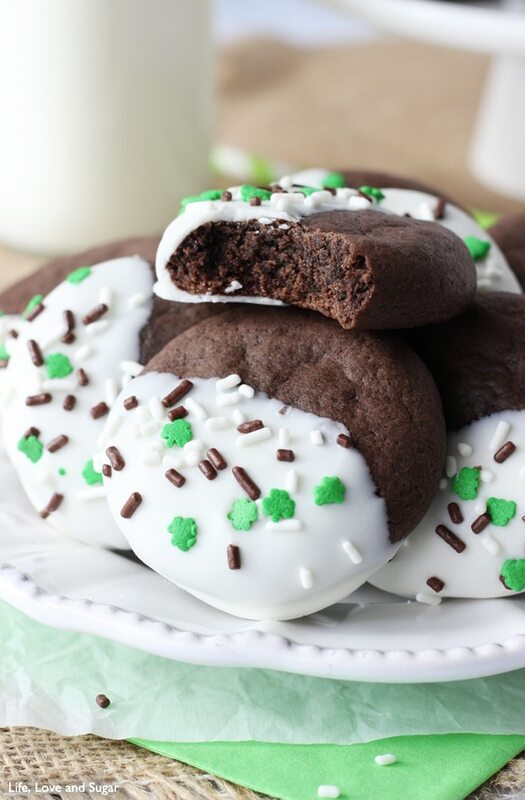 I also used thin, chocolate filled Oreos instead of the regular ones – they were much easier to crush AND it adds just an extra little bit of chocolate flavor. I’ll let you know how they turn out and what the reviews are 🙂 Thanks for yet another great recipe! These are AMAZING! Were a major hit at my dinner party. 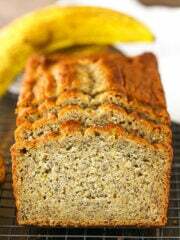 Thanks so much for sharing the recipe. I am actually interested in making these but wanted to do it as one big trifle?? What would you suggest for amounts in a trifle bowl??? I’d probably suggest looking at this trifle as a bit of a guide. They are similar in amounts and layering, but that one is full sized. 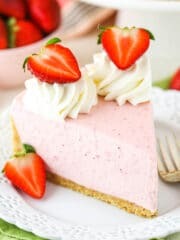 One difference is that the cheesecake layer has some whipped cream mixed in to lighten it up and add volume so you have enough for a larger trifle. I’d suggest doing that with this recipe – it’s 8 oz Cool Whip or 1 1/4 cups heavy whipping cream + 1/2 cup powdered sugar for homemade whipped cream. Then layer similarly to the full sized trifle – you might need some additional of the chocolate whipped cream to have enough. You could also add chocolate sauce, like I used caramel in the other if you wanted. I hope that helps! Made these yesterday for a picnic and they were a huge hit!! 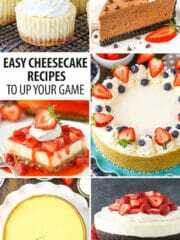 I found the cheesecake part to be very yummy! But I do agree the whipped cream was the best part. I made these in 12 mini 4 ou mason jars. Did not need to double the recipe. Ya, I’ll be making these again! Love these and they look delicious!! 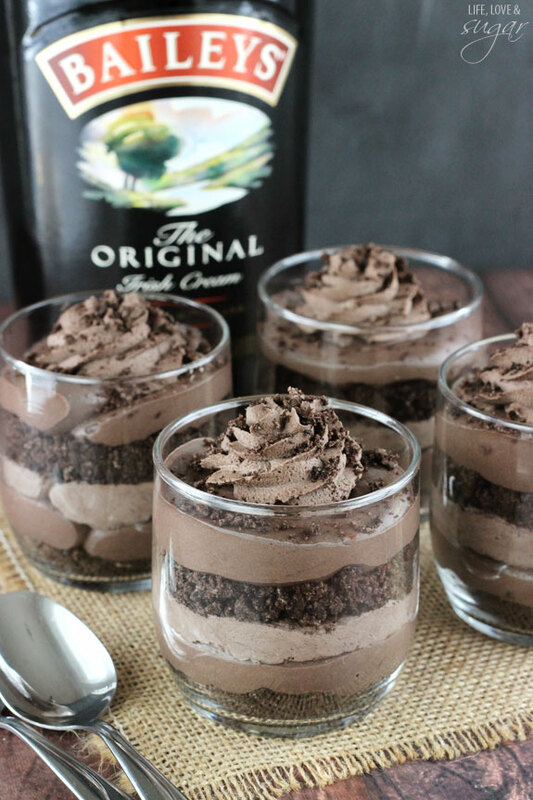 Making these for a work party but because I know there are those who don’t/cant drink alcohol, I’d like to substitute the Baileys, just not sure with what! Any suggestions?! Some people like to try the Baileys Coffee Creamer. Some of the Baileys taste, but no alcohol. With what I can replace the Baileys Cuz i don’t have it? You can just use milk in the cheesecake and just leave it out of the whipped cream. I believe these are 9 oz glasses, so you could probably get about two of your smaller trifles for every one of mine and the recipe makes 4, so 8 of the smaller size.